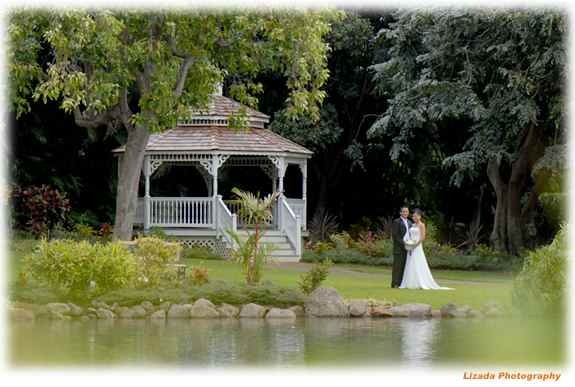 The New Plumeria Garden Wedding takes place in the beautiful Maui Tropical Plantation-- a 112 acre plantation filled with exotic tropical fruits, fragrant flowers and lush tropical foliage. The gardens are best between 11:00 AM and 4:00 PM, although winter weddings should begin no later than 3:30 PM -- as the sun sets behind the west Maui mountains. The flowers included in this package are: Traditional Maile leaf lei for the groom, a six foot lei made from fragrant leaves -- and a beautiful two strand tuberose or three strand pikake lei or two strand tuberose lei for the bride. - a deluxe cascading bridal bouquet and matching hairpiece or Haku head lei for the bride. If you wish, we will substitute other leis that match your color scheme. You may also order a variety of bridesmaids bouquets, nosegays, corsages, hair flowers, Haku head leis or boutonnieres at an additional cost. If you have guests you may want to order additional flower leis for them. Just let us know what your needs are and we'll be happy to arrange it for you. Your photographer will take a number of photographs during the ceremony, and afterwards suggest other picturesque locations in the garden for more formal and candid photographs. Your photography package includes 28 - 4x6 inch photographs in a white wedding album. Your photographer will take a number of shots of which you may choose the final 28 photos for your album. The bride and groom's toast takes place following the ceremony. If you have guests you may want to order additional beverages and glasses for them. Sparkling apple cider is included. The Gazebo Garden is also ideal for an intimate wedding reception from 50 to 100 guests. For larger grand receptions our Dining Room and other Outdoor locations are available.